Mary Koval, renowned vintage quilt and textiles dealer, has had a banner year. Drawing from her extensive collection of fabrics, Mary designed her blue and white �Remember Me�Blue� collection for Baum Textiles� Windham Fabric. Then, as a bonus to quiltmakers, Chitra published her �Mary�s Favorite Blue and White Quilts.� The book includes nine full-size patterns, instructions and even provides the quilting designs. These patterns were taken from Mary�s amazing personal collection of 250 quilts. Her blue and white fabrics are circa 1830. As dealers and appraisers know, blue and white quilts have maintained their value through the years. Two-color quilts are always popular and the contrast of blue against white is always appealing. Blue and white fits into almost any decorating scheme. 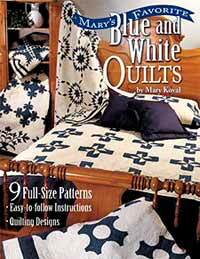 Mary�s choices for her book range from the complex patterns, as an unusual �Feathered Star� to more simple choices like �Pinwheel.� �Mary�s Favorite Blue and White Quilts� showcases a variety--both appliqu� and pieced quilts. 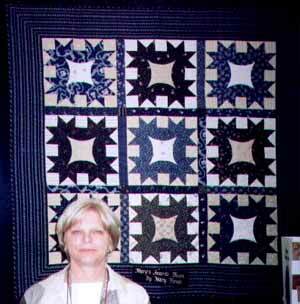 Over thirty years ago, on a quilt hunt in Ohio, Mary bought her �Touching Star� quilt from a dealer. 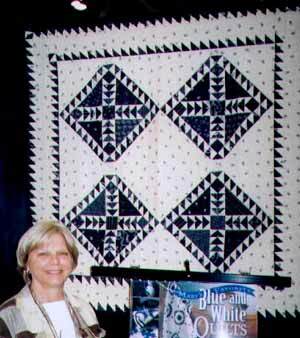 It touched her heart and, she says, �started my love for blue and white quilts. I held it on my lap all the way home to Pennsylvania.� The tiny diamonds, set in white, create a high contrast, striking quilt. We are lucky to have Mary�s �blueprints� for beautiful quilts and the fabric to reproduce them. �Mary�s Favorite Blue and White Quilts� joins her other books, �Mary Koval�s Antique Animals� and �Favorite 30�s Quilts Inspired by Grandma Buddy.� Although our attempts at creating blue and white treasures won�t have the patina of age that Mary�s do, now we can come close, using Mary�s book and her exquisite fabrics to recreate the look of Mary�s favorite quilts. To order Mary�s books, ask your local quilt store or visit www.QuiltTownUSA.com To contact Mary, go to www.marykovalantiquequilts.com. Her fabrics are available at fine quilt shops everywhere.